by Bill Dwight on Tuesday, October 26, 2010 at 2:12 PM | LEAVE A COMMENT! 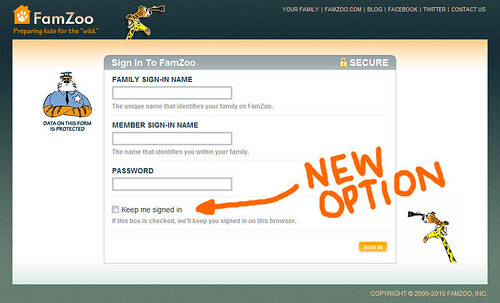 You may have noticed a new option at the bottom of the FamZoo Sign-in screen. It’s a check box called “Keep me signed in.” If you check this box before clicking on the “Sign In” button, you’ll stay signed in to your FamZoo account when using the current browser. That means you won’t have to enter your user names and password each time you come back. On mobile devices (Android, iPhone, iPod Touch), we now keep you signed in automatically, so you won’t see this option there. Whenever you’d like to explicitly sign out, just click on the “Sign Out” link beneath your family name in the right-hand side bar of the page.